Alpine Mint Bush. A bushy shrub with tiny dark green leaves, strongly scented when crushed. 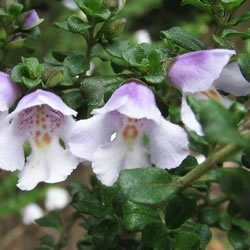 Broadly tubular white flowers with pretty purple and yellow markings inside. Height: 30-90cm. Spread: 30-90cm. Flower colour: White. Flowers from June to August. Evergreen. Foliage colour: Green. Frost hardy. Sheltered site best.